L: 19.5" x W: 25.5" x H: 41"
Halloway Dining Chair When it comes to the Halloway dining chair, strong lines and eye-catching detail create a transitional look that serves up fine dining for a variety of decorating styles. Distressed, espresso finish and parquet pattern oak veneers showcase this piece's natural beauty, while details including nailhead trim and dark, distressed wood add a rustic touch. The upholstery features a neutral colored fabric to make the sit-down dinner a comfortable experience. When it comes to the Halloway dining chair, strong lines and eye-catching detail create a transitional look that serves up fine dining for a variety of decorating styles. 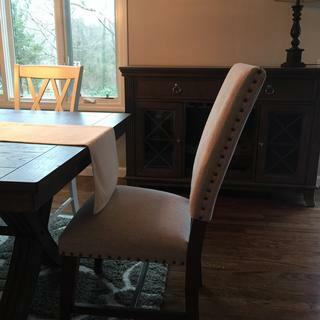 Distressed, espresso finish and parquet pattern oak veneers showcase this piece's natural beauty, while details including nailhead trim and dark, distressed wood add a rustic touch. The upholstery features a neutral colored fabric to make the sit-down dinner a comfortable experience. Dining chair features a polyurethane-foam-padded seat and back covered in soft and durable, 100% polyester upholstery for a stylish finishing touch and extra comfort. I love my set. Chairs are comfortable however a few of them aren't leveled. It's pretty bad. One leg on 2 of my chairs are at least a half inch shorter from the other legs. A little disappointed. My wife and I added 2 more chairs to our dinning room set. When the table is setup with the exertion, the extra 2 chairs help with seating and make the piece look fantastic. We love the look of these chairs but a few have minor defects. A few are wobbly but aren't too noticeable since our dining room is carpeted. The other issue is that a few of the studs(?) along the top of the chairs have been worn from the black color to the shiny undercoat. I am very happy with my purchase! I was on a limited budget for a dining table and chairs. After shopping every furniture store in my area, I feel I received the best value for the look I wanted to achieve. My sales person Lisa and the delivery men were professional & courteous! The delivery was white glove treatment! 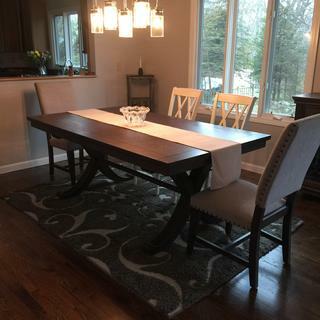 Looks great and comfortable for dinner meals with company. Bought 2 extra to fit around the table. Haven't really used them yet, but seem fine. We'll see how they are after Thanksgiving. Very elegant, nice color and really comfortable. I am very happy with this chairs. They are beautiful and comfortable. My husband who has back issues loves it because of the great lumbar support. Love this chair with the writing desk. Great chairs that go perfect with the new dinning set, very comfortable and they easy to clean spills. The color goes perfect with our neutral theme. We love the look of the chairs, however 3 of them are uneven and another one I had to exchange for a new one because I could not put it together as one of the holes for the stretcher was not drilled deep enough. Hello Matthew, we're very sorry to hear about this experience and would like to look into this for you. Could you e-mail your order details, contact information and a copy of your concerns to rfcare@raymourflanigan.com so we can better assist? Thank you! Does this table have a leaf enough to add 2 more chairs to seat 8? BEST ANSWER: Yes it does. We purchased it a few months ago with just the 6 chairs, but it has the leaf in case you need to add more room. Enough for two more chairs. Hope this info helps! Yes it does. With the leaf it very comfortably fits 8 chairs. BEST ANSWER: Hi Lori! Thank you for your interest in the Halloway collection. The dining chair fabric is definitely a light grey and not cream. The wood is finish is a dark brown but has gray/pecan tones and a distressed look. Yes, it is a dark grey like a gunmetal grey. Looks distressed. It's a very comfy sofa too. Yes the fabric is gray. Can I get this chair in leather? BEST ANSWER: The Halloway dining chair is only available in the fabric shown.